So, you’ve shoved the Halloween costumes back into the wardrobe, craned your neck at fireworks and marked another year of remembrance with a poppy. What next? Bath Christmas Market starts early this year, throwing open its wooden chalets on 26th November and reining them back in again on 6th December. The location is perfect, however, with Christmas lights nestled snugly between Bath’s main Abbey and the Roman Baths, whose thermal waters have poured forth for over 2000 years. Better yet, Bath’s well-connected by road and train and a great place for a weekend break in its own right. You’ve got a bit more time to get to see the Strasbourg Christmas Market, as it runs from November 28th to December 31st. Strasbourg has been doing this kind of thing since 1570 and offers a range of Christmas Market experiences. It’s not just gingerbread biscuits and twinkling lights, Strasbourg hosts literary markets, children’s markets, Christmas walks and even tapestries. Try and find the Bredle cookies made especially for advent. Don’t think that northern Europe holds the monopoly on festive cheer, the expansive Place Capitole in southwest France’s Toulouse hosts its own Christmas Market each year. As well as traditional wooden cabins and mulled wine, you can find pepper-cherry wine, strange potato dough and an impromptu ice rink. Opens Saturday December 12th. Bremen doesn’t mess about when it comes to Christmas Markets, even the side streets leading up to the main event drip with glühwein, candlelight and iced biscuits. You can taste a bit of the Schlachte Magic from 26th November and immerse yourself in Christmas carols, cathedral tours and organ recitals in this UNESCO World Heritage Site. 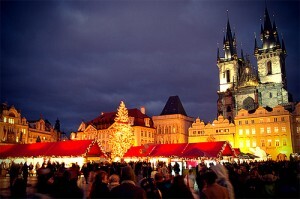 Wrap up warm, warm, warm because it is cold in Prague for Christmas. Everything’s on hand to soothe chilled and aching bones, however, from the spicy gingerbread, to the mulled wine to the proud range of Czech beer and hearty dumplings. Christmas Markets take place throughout December in the Old Town Square, as well as in the festively named Wenceslas Square. So there you go, that’s my top 5 Christmas Markets for cheap weekend breaks. I was feeling pretty scrooge-esque when I started but now I’m humming Christmas carols to myself…Another round of Good King Wenceslas, anyone? Tra-la-la-la-la-la-la….